1st Gear: Ford Evos points toward the future Ford's Evos concept is just that — a pure concept with no chance of production. What it's meant to do is show how Fords around the globe will look, especially in the front, with its narrowed headlamps and single Superman grille opening. It's also sporting some raft of Skynet-like technologies that could supposedly let you sleep in late while mapping the route to Dunkin' Donuts. 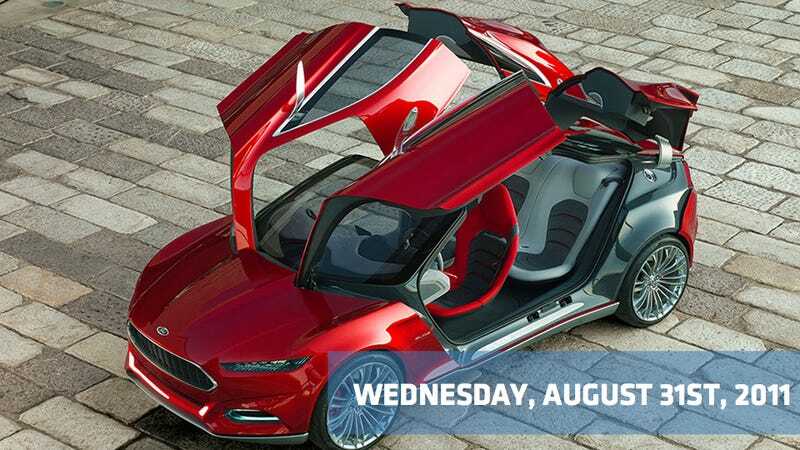 Ford execs will explain what "visual premiumness" means, likely with maximum bombasity, at the Frankfurt auto show in a couple of weeks. You can see a gallery of images here. 2nd Gear: UAW takes the only swing it has Speaking of Ford — the United Auto Workers will likely grant its leaders the power to call a strike against Ford as contract talks progress. In most contract years such approvals are formalities, but thanks to the deals worked out with the U.S. government in General Motors and Chrysler's bankruptcies, Ford is the only Detroit automaker the UAW could actually strike. The threat is symbolic — the union hasn't called a general strike during contract talks in decades, but the overwhelming approval in some Ford plants reflects how line workers want some concessions rolled back, especially in light of CEO Alan Mulally's $56.6 million payday. 3rd Gear: BYD's dreams struggling to come true With sales slipping, China's BYD now appears to be running short of funds to carry out its ambitious plans for electric cars, according to The Wall Street Journal. Reports from China say the Warren Buffet-backed company is considering a large layoff of up to 1,800 workers, after a series of new gas-powered models failed to reverse a sales slump. Whocoodanode? 4th Gear: Cheney against GM, Chrysler heart transplants Imagine if the Harry Potter books had been written from Lord Voldemort's point of view, and you'll have the general spirit of former Vice President Richard Cheney's new memoir, in which Cheney reveals he would have let General Motors and presumably Chrysler collapse and die in 2008 rather than tiding them over with government money until President Barack Obama could inherit the mess. Despite projections of thousands of lost jobs, "I would have preferred that the government not get involved," Cheney wrote according to The Detroit News. For a guy who doesn't have a heartbeat, Cheney sure doesn't seem to care about the company that built the first mechanical replacement for people with dead lumps in their chests. 5th Gear: The Citroën DS5, the latest in French technology This is the Citroën DS5, a diesel-hybrid hatchback the French firm will take to the Frankfurt show next month. Powered by the system it shares with Peugeot, the DS5 sports 200 hp, four-wheel drive and electric-only cruising power. The setup means the mid-size hatch is good for about 63 mpg, while looking more attractive than a Prius. Expect it to arrive in the United States half past never. 6th Gear: Porsche 911 prototype gets a little flame-y An all-new Porsche 911 cabriolet prototype out for testing in Germany caught fire and burned in 15 minutes, with the chief of the local fire department saying the Porsche "burned like tinder." Man, Porsche is really taking this competition with Ferrari seriously. On this day in 1955, William G. Cobb of the General Motors Corp. (GM) demonstrates his 15-inch-long "Sunmobile," the world's first solar-powered automobile, at the General Motors Powerama auto show held in Chicago.